Sadly, the controversy around the Kuwaiti social media influencer Sondos AlQattan continues. As with her initial post, which she recorded two weeks back, her additional comments over the past week initially defending her views on Kuwait’s new laws protecting domestic workers from the Philippines have not helped in calming the situation. In her latest video, recorded and shared yesterday, she accuses Western media of anti-Muslim and anti-Arab/Gulf bias, adding that she’ll lead boycotts of brands she has worked with who have terminated their relationship over this incident. I’ve been asked a number of times for my views on what is happening. I talked with the good people from the Gulf News business desk this week on the issue of when influencers go rogue (go on, have a listen). I’m including here a summary below, as well as additional inputs from what has happened this week. Influencers will cause more crises – Consumer brands are working with an increasing number of influencers. These people aren’t celebrities, who are often media-trained. All of us have the ability to go online in a matter of seconds. Add that to a significant following and brand endorsements, and you can except more situations will happen which will burn brands. Brands need to act quickly – The lack of response from some of the brands who have a relationship with Sondos AlQattan was striking. Despite both social media mentions and media inquiries, some brands just didn’t respond. I’d understand if the delay were a day or two, as this is the Middle East and regional offices often feel the need to go back to corporate HQ for advice and guidance. However, two weeks is inexcusable. It harms the brand, and in the eyes of consumers it makes companies look negligent at best, complicit at worst. There’s two words all communicators need to know – brand safety. Consumers want brand clarity – Some of the initial brand responses were wishy-washy. To quote one brand, a spokesperson said, “[the brand] does not support or align with the recent statements made by Sondos AlQattan.” What does this even mean? Will you stop working with the person, or not? That’s the question. I’ll repeat a simple mantra here – communications is 90% what you do, and 10% what you say. This was a fail, and it was reflected in the headline above. Is that really how the brand’s communications team wanted their stance to be perceived? I’m assuming not. Consumers care about brands working with Sondos AlQattan today – I was also asked about a brand that I work with, which had once worked with Sondos AlQattan. I can’t think of a beauty brand which hasn’t worked with her, given her 2.3 million followers and her focus on makeup. However, consumers online only care about those brands who are associated with Sondos AlQattan today. Brands can come out of this positively – I initially felt for those brands who were associated with Sondos AlQattan at this time. Even though I’ve talked about background checks, there was no way that any of them could have foreseen this crisis. 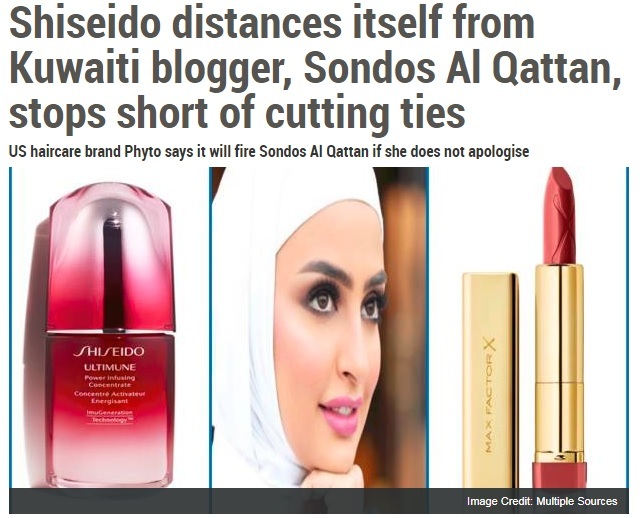 However, what is memorable is that the brands who came out first with a clear position have been viewed positively by those who have been angered by the statements made by Sondos AlQattan. Consumers have felt as if these brands have listened to their concerns and acted upon them. Always remember your employees – One aspect of this which has been rarely mentioned is the internal communications aspect. May companies operating in the Gulf are diverse in their employee hiring, and I doubt any of the brands who are working with her don’t have Filipino nationals on their books. How do these employees feel about the stance their companies are taking? There’ll be a good deal of both anger and sadness among the employees of brands and distributors who are caught up in this sorry situation. I only hope that the internal communications is clearer than the external piece (the narrative should be the same here in any case, given that many employees will be following this story externally). That’s it from me for now. I hope I’ll be able to resume blogging on another subject during the weekend. For now, good night! This ebook will help communicators understand the how, what and why of internal communications and what it means for their own work. For far too long, we communicators haven’t done enough to communicate what we do and why we do it. We haven’t put the day job to use when talking about our own value. With the help of groups such as IC Kollectif, this is changing. The IC Kollectif’s founder Lise Michaud launched an initiative to bring together communications from across the globe, to talk about different aspects of internal communications to help others understand what we do, how we do it, and why. The result of Lise’s efforts in persuading thirty communicators is an ebook. Named Disrupting the function of IC – A Global Perspective, the ebook is free and covers a wide range of topics, including Changes and Challenges in Internal Communication, the Skills and Knowledge of Internal Communication Professionals, the Impact of Technology on The Profession, the Leadership Role of IC Professionals, Employee Advocacy, the Convergence and Integration of Communication Disciplines, Collaboration Between Internal Communication and Other Disciplines and the Future of the Profession. I want to draw on the inspirational foreword to the book. Written by Anne Gregory, who has devoted her professional life to promoting the communications profession, the foreword sums up why internal communications matters, now more than ever. Not only is [organizational life] getting less predictable and the issues that have to be grappled with more slippery, but organisational form is changing too. Companies like Uber and AirBnB are totally different from traditional companies and their disruptive influence means that more traditional, established companies are having to respond in radical ways. Governments, too have to re-engineer the way they are interacting with citizens and this requires huge internal change programmes in the public sector. People want a level of constancy when all around is changing. This is driving a huge focus on organisations reexamining their purpose and values in ways that provide meaning for people who are not only coping with huge organisational change, but who are experiencing all the lack of certainty and turbulence that is present in the world. Organisations are a point of stability for many and at the heart of this is IC. For all these reasons internal communications has come of age, and not before time. That this volume is available free is testament to the commitment of these authors of IC Kollectif to share their work and thinking widely for the benefit of the global internal communication community. For this, our professional community is deeply grateful. I’d like to reiterate Anne’s thanks for the work which has gone into this seminal piece of literature. If you’d like to know more about IC Kollectif and download the book, please visit the website (you can click here), sign up and get reading. For my third guest post this week, I’ve asked internal comms specialist Kevin Ruck to weigh in on the link between good internal communications, employee engagement and customer service. Kevin Ruck, who is a founding director of PR Academy, initiated and designed the internal comms qualifications accredited by the Chartered Institute of Public Relations. Kevin is a regular speaker and author on all aspects of internal comms. He can and should be followed on Twitter at @AcademyKev. Over to you Kevin! As exceptional levels of customer service become more commonplace and enable organisations to thrive in challenging times, poor and mediocre service are increasingly noticeable. And in this ‘age of outrage’ customers are likely be more inclined to call out poor service in a very public way. So how can organisations find ways to ensure that customers love what they do? In this post, I reflect on my own experience as a customer service manager and consider how internal communication might be one way to underpin a customer service oriented culture. I spent many years early in my career dealing with complaints about poor telephone service in the UK. This was back in the 1980s when most telephone exchanges were mechanical (not digital like today) and the state of the line plant was fairly poor, resulting in lengthy delays to repairs and ongoing problems. Anyone remember crossed lines? Dealing with people who complain is a very demanding job. No organisation will always get everything right, but it’s how customers are treated when things go wrong that matters. Even back then we realised that turning round a dissatisfied customer could be very beneficial for business. This often entailed doing something unexpected or behaving in a way that showed that you really cared. All good points. I also like the example of British company, Brilliant Bikes, who state that ‘We look for ways to help cyclists get more from their bike. If a customer turns up at the shop early, we open early. When someone phones, they get a human’. This exemplifies a sense of purpose within the business that is translated into customer service. So, how can all organisations get these approaches embedded into what they do? This is a tough question. One that many academics and CEOs have grappled with for many years. I’m not going to provide a personal five point listicle in this post. That would imply that there’s a simple solution which patently there isn’t, otherwise excellent customer service would be ubiquitous. Instead, I will set out how two broad principles for internal communication are important for a strong customer service culture. In my PhD research, I found that internal communication that is focused on keeping employees informed and employee voice is likely to lead to higher levels of organisational engagement, including what employees do to help the organisation succeed. Good internal communication is a strong enabler of an organisational culture that leads to engagement. And there’s little doubt that engagement and customer service are connected – as reviewed in an Engage for Success report in the UK. Organisations that adopt what I’ve called an AVID model of good internal communication practice (see below) are likely to develop a culture whereby employees trust senior managers and feel a strong sense of belonging. Feeling informed, feeling that it’s safe to voice opinions that are treated seriously and feeling that senior managers care about everyone makes employees feel valued. And this can, in turn, enable employees to bring their whole self to the work that they do – including the service provided to customers. One employee said to me that she could tell when a senior manager was listening to her when she noticed that he ‘was smiling but not with his eyes’. In the same way customers can tell when an employee genuinely cares for you as a customer. Some CEOs, such as Vineet Nayar at HCL Technologies, go as far as to say that the best way to provide great customer service is to put employees first. As Nayar explains, ‘The first thing that you need to do is create an environment of trust where the employees believe what you are saying and are willing to follow you wherever you are going’. This focus on employees is also highlighted in a new approach to leadership, known as ‘responsible leadership’ which incorporates four dimensions; sustainability and the environment, risk analysis, care for employees and monitoring of subcontractors (italics added). So, great customer service can be generated through responsible leadership, communication and engagement. It requires systemic approaches to communication where senior managers take their communication role seriously. That’s why it is hard to achieve. But get it right and organisations will thrive in a 21st century service centred economy. There’s been much talk about communications and how the role of the communicator is changing. As part of this debate, I wanted to get a different insight. I spoke to Kate Hamilton-Baily, Director at the leading global communications executive search firm, Taylor Bennett, to get her perspective on what business executives are looking for from their communication directors and what we need to do to make sure that we’re prepared for today’s job market. Kate spoke at IABC’s Eurocomm 2016 event in Rotterdam. I caught up with Kate to ask her a couple of questions on issues such as skills, employability and the convergence of marketing and communications. Alex: So tell me about yourself Kate. Kate: I’m one of the directors of Taylor Bennett, an specialist executive search firm which focuses purely on senior communications roles. With our sister companies Heyman Associates in the United States and Taylor Bennett Heyman, in Asia and Australasia. We have fifty search professionals globally focused on senior communications briefs and we meet over two thousand senior communications professionals every year, so we have a pretty good understanding of what is shaping today’s top communicators. Alex: So, what are the big communications issues that executives care about? Kate: Reputational management has moved up the agenda following the financial crash in 2008. It is now recognized as having a tangible impact on the success of a business or organization or institution. In line with this has been the breakdown of trust between the public, government and many parts of the business world, alongside the growth of digitization and an incredible range of new social media channels. Internal communications and engagement has really come of age and is seen as a strategic and important discipline. Then there is the convergence between marketing and communications. Digital has had a major impact on the communications role, as has the breakdown in trust between the public, government and business. Executives want someone who can cut through all of the data and tell the organization’s story in a creative, transparent way that will engage multiple audiences externally and internally. They’re looking for a talent that can marry the gap between what the organization says and means and what the public hears and understands. Alex: What other issues are you seeing? What is driving communications? Kate: We’re witnessing the need for both deep expertise in areas such as internal communications and engagement but also broad corporate leadership attributes and skills at the top end able to understand how to campaign effectively and get their message across in a very noisy world. Business understanding remains critical. If I look into career progression, mid-career experiences are vital in terms of your future progression. So, for example, if you have only worked in an external communications role, or in government relations, spending a year in internal communications will give you a completely different perspective and really help as you go for more senior director level roles. Alex: Tell me about convergence. What does this concept mean to communicators and their careers? Kate: Convergence has been around for a while, especially in the B2B space. Marketing used to lead communications especially in the B2C sectors, but with concepts such as reputation management it’s become more complex. You’re now seeing communication directors who have responsibility for the corporate brand. And on the flip side, CMOs who are responsible for a far more fluid and complex communications landscape. However, there is an opportunity for communicators to learn from their colleagues in marketing especially around adopting a strategic and analytical approach and merge those skills with the storytelling approach that communicators are expert in. Measurement isn’t a natural focus for some communicators but this is changing. And then there’s the ownership of channels, such as social media. That can be a difficult internal debate. Communicators also need to be very well networked, to know the business and understand the challenges that other functions and colleagues, in operations, HR and IT face so, that they can step in and support them. Alex: What skills, experiences and personal attributes do clients ask for? Kate: This varies based on the business leader and the industry they’re in. There’s a real variance in what the ideal communications leader looks like based on the business, the organization and what the CEO is looking to do. There are general trends, however. Internal communications and engagement has moved up the CEO’s agenda. And many business leaders are looking for a strong, integrated in-house approach featuring the full complement of skills communications, public affairs, sustainability and internal communications that can work across multiple markets. What I’d add is that business leaders want a communications person who has good judgment, who can offer strong counsel in a crisis, who understands the business, is a good leader and who can make a meaningful contribution to the business whilst building a strong communications team. There is a long list! Alex: How should a communicator assess their abilities and look to get ahead? Kate: Firstly, we want to understand what you have done in your career and how you did it. The context of the challenge, the a-b journey. People in communications can change sectors and the ability to adapt to different cultures and industries is highly valued. We are also interested in your leadership and management capability. How have you developed your team, what lessons have you learned and what challenges have you faced. Who you are as a person and what motivates you is really important to understand. Some firms will use psychometrics within a process to help understand how people will fit in and behave in contrast to others. And there’s the interview process which can be multifaceted, in order to get different viewpoints. Alex: What’s your one piece of advice to communicators in terms of what they should do to help their career prospects? Kate: Challenge yourself, don’t be afraid of changing sectors. Ask to do different things, ask for more responsibility, to be seconded to a different country, or have the opportunity to work on a new project. Know your strengths and areas for development and work on them. Network. Most importantly enjoy what you do. And of course, get to know headhunters! Every now and then I’m allowed out of the country, and some of those trips make for some remarkable learnings. One of my recent trips was to Ghana. I met with a fair number of communications professionals from across West Africa, including from Nigeria. There was much talk around what I call the usual suspects – digital, social media, measurement et al – but what struck me most was the challenge that our colleagues in West Africa face when it comes to educating clients on the need to move beyond media relations. There was one panel which opened my eyes to how similar West Africa is to the Gulf. Four gentlemen (and no ladies) from the national Nigerian and Ghanaian PR and African associations took to the stage to talk about the challenges and opportunities faced by communicators in the continent. What seemed to be repeated over and over again was the need to move communications away from pure media relations and towards a more holistic model; like in the Gulf, it seems that many clients are keen to get their pictures in the papers, their voice on the radio and their silhouettes on television. There wasn’t much in the way of a response from the panel, aside from pointing a finger at the numerous journalists who had joined the public relations profession and who were keen, or so the argument would go, to keep the industry focused on media relations as the only deliverable for clients. What was a surprise to me was that Nigerian comms professionals have to be registered with the Nigerian Institute of Public Relations to hold mid to senior-level comms roles in the country. Living in a part of the world which is unregulated when it comes to PR (nearly all of the comms people I know don’t even have a formal education in the discipline), I do like the idea of having an independent standard to meet and maintain. However, as one member of the audience pointed out, it had taken her just over a decade of chasing to secure her membership of the Nigerian Institute of Public Relations and hence be eligible to hold a senior comms role. While some aspects of the sector may be different in Nigeria, bureaucracy remains. You don’t need me to tell you that women are better communicators. They simply are, full stop. It was wonderful to see that three-quarters of the room were women, and many of them young ladies at the beginning of their careers. The local panel was full of men, an observation not lost on one brave lady who pointed out the imbalance between those on the stage and those in the room. However, looking long-term women will hopefully dominate at the top as they do at the mid and entry levels in the comms sector in West Africa. Another observation was the strength of the national talent. There were very few expats, which was a revelation for yours truly after being based in the Gulf for so long. While I was imagining Nigeria’s Lagos becoming a hub for comms across Western Africa and hence attracting expat talent, what I saw was a room full of (mainly) young, talented Nigerians and Ghanaians who care deeply about what they do and why they do it. If you have experience of comms in West Africa I’d love to hear your inputs. Do you agree with the above, is there more you’d like to add or am I off on my observations. Don’t be shy, leave a comment or two! There’s a reason why internal communications is the base of any communications function – you need to ensure the message is understood internally before spreading that message to a public audience. Emirates Airline had a taste of not to get things right this week after announcing its financial results for last year. The below quotes are taken from www.arabianbusiness.com. 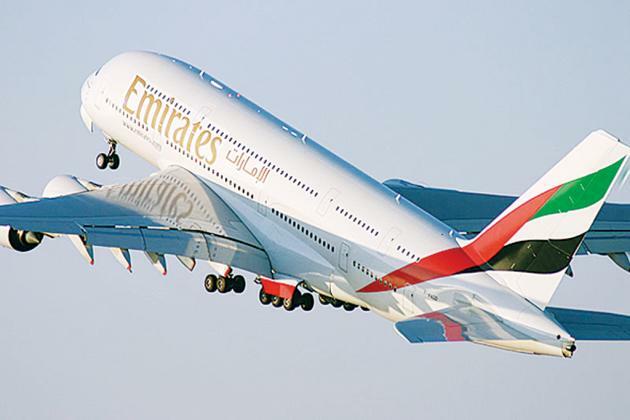 Dubai-based Emirates Airline has posted a 52 percent increase in profits to $622m in the last financial year. Meanwhile, Emirates Group – of which the airline is a subsidiary – posted a 34 percent increase in profits to $845m, helped by a 17 percent increase in revenues to $21.1bn. For Emirates Airline staff, much of their potential compensation is paid in the form of bonuses which they receive if the company hits certain targets. It seems that the company however is not paying out bonuses this year. This disappointment is clearly reflected in the comments section of the Arabian Business piece which I’m posting below. Emirates profit release doesn’t mean a thing to its more than 68,000 people who in d end didn’t get a single dirham share. Two consecutive year of no bonus seem to be too unfair when all you read in the paper is of company’s soaring revenue and money generated. I totally agree. Its the people thats the source of the company’s success but always been taken for granted. Will the cabin crew finally get the long waited promised bonuses??? It is a very sad day for all Emirates Airline employees. Not a single dirham was shared with the men and woman working for the airline. Huge profits and nothing was given back to the staff. Zero profit share. I am guessing Emirates is part of paying off Dubai Inc’s debt?? Someone at Emirates has had the sense to post a follow-up piece for Arabian Business stating why bonuses haven’t been paid, apparently due to targets not being met. However, wouldn’t have it been wise to have focused internally on the messaging rather than going out in the media and trumpeting the growth whilst forgetting or not focusing on how to assuage the feelings of those who have done their best to deliver on that profit, namely Emirates’ staff? You can read the follow-up story here. I can’t wait for the comments to come rolling in. I was incredibly lucky last week to listen to two compelling business consultants. I’m usually a hard critic to please and I don’t often take to consultants coming in to tell me what I should and should not be doing. But the two gentlemen who came into the company last week, Scott McKain and Jonar Nader, both emphasized the importance of listening and knowing your customer. What impressed me most during the two days of business and management workshops was Nader’s insistence that companies fail because of a disconnect between their employees. By forgoing the people-management skills and internal communications companies fail to engage their staff. For more about Nader and his thoughts have a look at his blog which includes thoughts on his visit to Dubai. I couldn’t agree with Nader more on people management being at the core of a company’s success and failure. Both Nader and McKain talked about information, about communication between employees. One of the best tools that I ever used and managed was was an internal website, an intranet. It may sound strange – after all an intranet is only designed for use by employees rather than the general public. Its audience is strictly defined and limited. However, I’ve found that companies with intranets have a much better educated workforce. Employees generally understand their firm’s rules and regulations much better than companies who don’t have an intranet. An intranet also plays a major role in keeping the workforce up to date in terms of new products, successes, and company changes. In short, the more a workforce is empowered with information, the more your employees will communicate. The less they’ll be in the dark about where the company is headed and how the company intends to grow. Your employees become your advocates rather than your naysayers. For the return on the investment is there anything better than an intranet and more internal communications in general? And if you’re interested in knowing about Scott McKain have a look at this video!